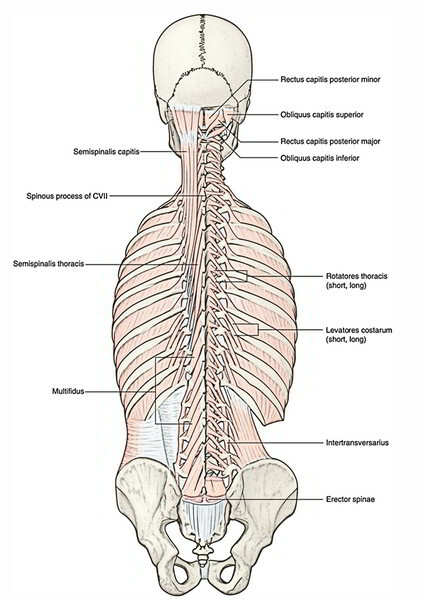 The Multifidus muscles is the second group of muscles towards the semispinalis situated deep within this group, span the length of the vertebral column, going through a lateral point of beginning upwards then medially in order to connect with spinous processes and also extending amongst two and four vertebrae. The multifidus muscles are better formed within the lumbar region but occur all over the length of the vertebral column. Through all the mamillary protuberances. Through all the transverse protuberances. Through the articular protuberances of the lower four vertebrae. By the medial section of the dorsal ramus of the vertebra under it each fascicle of a given vertebra has a different innervation. The firmness and balance makes each vertebra work more efficiently, and as a result of friction through normal physical exertion decreases the deterioration of the joint structures. The multifidus is said for being vital for lumbar stability of the deeply positioned intersegmental muscles. Superficial multifidus collaborates with the erector spinae and varies according to the trajectory of arm movement. The deep multifidus collaborates with the transversus abdominis, and these muscles are effective equally whatever the arm movement direction. Also the action of specific parts of the multifidus is unique according to the body’s readiness for the task, that is, whether the subject is anticipating the movement as if the body was attempting to fine-tune its balance response.